These files cannot be displayed inside the content area, so you first upload them to the webserver using the Upload Files feature. NOTE: These instructions show how to upload and host files on your WordPress site. 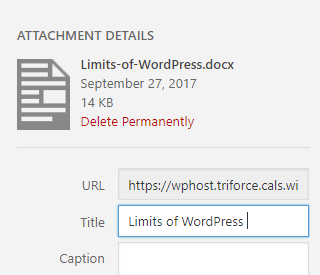 If you have more than 100 files to host, and/or need tighter security on who can access the files, you may want to read these instructions on how to upload files to Box, then link to the file in WordPress. Position the cursor where you want the link to appear. In the main column area, click to choose an existing file, or click Upload Files. The main column area changes to read “Drop files anywhere to upload or Select Files.“ Click Select Files. Locate and select the files. Need to Replace an Already-Linked File with an Updated Version? If you don’t want the old file to accidentally turn up in a Google or site search, go into the Media Library (Media on the black Admin Dashboard menu at the left), and find the file and delete it. You may need to use the Search media items box in the upper right of the screen. Delete the link to the old text. In the right panel, enter the text you want to appear as the link text in the title box.